I was at my local Barnes & Noble today, and I decided to do something I often do: look about for "Appendix N" material that has snuck back into print. It's a sadly shrinking landscape, unfortunately. Only one volume of Howard appeared, with no Elric and for probably the first time I can think of it, no Andre Norton. Lovecraft and Tolkien are by far the best represented, and Roger Zelazny's Amber books are still in print. Skimpy trade paperbacks of the first three Mars stories by Burroughs are the only other material from actual Appendix N authors. A second volume I found, American Supernatural Tales, is edited by S.T. Joshi, who has made a killing on this kind of thing. It features Appendix N authors Lovecraft, Howard, Derleth, and Leiber as well as several more must-reads: Robert W. Chambers, Clark Ashton Smith, Karl Edward Wagner, and Robert Bloch. It also has stories from people who should be read on general principle - the classics in Irving, Hawthorne, Poe and Bierce, to Ray Bradbury and Shirley Jackson. Short stories and novellas have always been very special to me as a form. I've been reading a lot of them lately, mostly Clark Ashton Smith and Manly Wade Wellman (the latter thanks to Michael Curtis's Chained Coffin Kickstarter) and the form has always struck me as essential for fantastic literature. Of course, I love novels – whether Tolkien's dense epics or the light reads of Burroughs – but I find briefer jaunts are often more satisfying. The short story author has no time to spend on long descriptions or travelogues; a world must be sketched quickly and dynamically, and the point arrived at in brief. When I got into fantasy short stories it was in the mid-1990s, my high school years; in a way it was a relief from overly long fantasy epics and tie-in novels. Short stories, by contrast, can focus on an incident or oddity without becoming tedious; they are great for shifting in mood. You can read a Conan story in the morning and a Lovecraft tale at night, and the next day switch to something in a science fiction vein, if you like. Even a single author can vary widely, such as the drastic shift from Lovecraft's "The Doom That Came to Sarnath" to "The Colour Out of Space." It's a day trip rather than a long vacation. Sword & Sorcery's revival in the '60s was focused around short books, beginning with one called Swords and Sorcery and continuing with its follow-ups, The Spell of Seven, The Fantastic Swordsmen and Warlocks and Warriors. Edited by L. Sprague de Camp, these books are not terribly hard to find and really defined the subgenre at the time D&D was about to come out. They're a better guide to it than Appendix N; in addition to Howard, Leiber, Moorcock, Vance, Dunsany, Anderson and Zelazny (and the markedly inferior epigones, de Camp and Carter) they feature Henry Kuttner, C.L. Moore, Clark Ashton Smith, Robert Bloch, John Jakes, and a few others. The great thing in these sort of anthologies is the breadth of worlds that you visit. I think that the idea that everything today in fantasy is not only a novel but a series of novels manages to diminish that kind of breadth, exchanging it for depth in a single world. For a roleplayer, though, I think breadth of ideas is far more important. So it's good to see these kinds of anthologies back on the shelf. There's nothing wrong with extended stays, but it's good to be able to make day trips. OD&D lists a bunch of increasingly weird options at the end of the monster types - dinosaurs, living statues, robots, androids, etc. Do you remember any encounters with that kind of creature? Greyhawk was FULL of weird sh*t. Once you got below the fifth or sixth level the odds of encountering anything "usual" except as a wandering monster was virtually nil. Go look at Rob Kuntz' "Bottle City" for an example. It was ALL weird! Somehow, the idea that Greyhawk was vanilla crept down into the gaming world, and it has sort of lodged there as one of the great falsehoods of our hobby. It leads to the perception of the megadungeon as nothing more than a reverse mountain of stock fantasy, and of the Greyhawk setting as a big boring realm, when nothing could be further from the truth. The Future or Machine Age: While some steady readers might think that I harp on this topic too much, the first time I came in contact with a level of this type was in the “mighty” castle of Greyhawk; run by Gary Gygax and Rob Kuntz. Imagine conveyor belts that force players to travel in one direction or another, a cellophane machine that wraps you up no matter how big or small you are and puts you in a holding area for as long as it takes to rip yourself out, how about a die press that shapes anything in its path into a bottle top (Boy, can that hurt! ), or a row of blades that cut in a pattern on the belt with a 25% chance that any given blade will cut you? Try a slot machine that takes only large sums of gold and with the flip of the handle takes a random magic item from the party, and how about a lever that turns on something way off in another part of the level (like a robot or level clean up machine) that you can’t know about until you travel to that part of the level? The treasures of this level could easily be more fun than the level: imagine bottle tops made out of mithril on wine bottles; how about guns and pistols that work; a set of chain mail made out of a super hard and light alloy that acts like plus 5 armor and shows no magical traits; how about a huge pile of gold dust in a large plastic bubble that isn’t small enough to get out the door and can’t be cut by anything less than a plus 5 sword? Archivists of the magazine will recall that this was the very same issue in which Gygax writes up a foray from Greyhawk Castle inhabitants onto the Starship Warden of Metamorphosis Alpha fame. A story, which is too long for me to quote here, by Gygax talks about the Black Reservoir, a massive body of water in Castle Greyhawk. (Allan Grohe, who created that Greyhawk site, ran a group I was in through some of that Reservoir using the AD&D rules.) And of course several oddities from Greyhawk have seen print: Gygax's EX1 Dungeonland, EX2 The Land Beyond the Magic Mirror, WG6 Isle of the Ape; and Kuntz's The Original Bottle City, The Original Living Room, and Garden of the Plantmaster. What this adds up to is the opposite of a big vanilla madhouse. The point of this classic megadungeon was to get down, survive the weirdness, get the treasure, and get the hell out. Perhaps most impressive is that Gygax and Kuntz were so good at making these environments into really challenging game areas, as we see in Ward's summary: the things that are trying to kill the PCs are themselves objects of intense curiosity. Forays into science fantasy are expected; there is a way to get to Jack Vance's Planet of Adventure and face the birdlike Dirdir (documented in the DMG) as well as to Edgar Rice Burroughs's Barsoom. One of the remarkable things about Greyhawk is how literary it was; everyone talks about Appendix N as inspiration, but Gygax was using various novels straight-up as material for his dungeon. This of course allowed Gygax to use puzzles, riddles and puns that relied on real-world references and wouldn't make sense in a totally fleshed out fantasy-land like, say, Tolkien's. Compared to this, S3 Expedition to the Barrier Peaks seems almost par for the course of what you'd expect in a Gygax dungeon. That is, moments of silliness and humor help to contrast with the grinding seriousness of a titantic struggle and relieve participants at the same time. In the ponderous high fantasy seriousness of the '80s, the railroady plots of the '90s, the over-the-top '00s and the grimdark teens, it's way too easy to lose sight of this simple advice. Gygax was on the ball, but more importantly he managed to shift tone without losing playability. That's really the most important takeaway from all this: everything described above was seamlessly part of the game. It didn't stop to look at something cool, there was something interesting just around the next corner and an encounter in Wonderland was just as threatening as anything in the grim "area of evil." 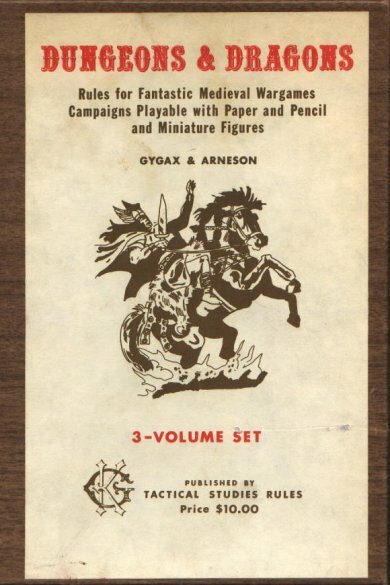 Arneson had a reputation for being the weird one, but in the most productive era that he had, Gygax really laid this on thick. It's not a coincidence that large chunks of Appendix N are either planetary romance, post-apocalyptic or straight-up science fiction. So the next time you're wondering how to make your dungeon a bit of a stranger place, try to make it a little more like Greyhawk. You won't go wrong. Monsters can be lured into service if they are of the same basic alignment as the player-character, or they can be Charmed and thus ordered to serve. Note, however, that the term "monster" includes men found in the dungeons, so in this way some high-level characters can be brought into a character's service, charisma allowing or through a Charm spell. This is something that I know Mike Mornard has talked about several times with relation to Gygax's Greyhawk campaigns: the dungeon should be fertile ground for retainers. Recruitment from adversaries is something I think has gotten neglected in OSR materials, and in later editions of D&D. The text above comes shortly before the reaction table, which in itself I think should be used more frequently. In my experience, roleplaying in the dungeon or wilderness has an interest element to it that you just can't get in a city, where the negotiation could lead to violence at any moment. The point about the "same basic alignment" is much more interesting in OD&D than in classic or advanced D&D. Lycanthropes can be neutral, as can orcs, ogres, dragons, wyverns, centaurs, hydrae, purple worms, sea monsters, chimerae, minotaurs and giants. Among the types of men, Bandits and Buccaneers can be chaotic or neutral (50/50 chance); Berserkers, Cavemen and Mermen are all neutral; and Dervishes are lawful. This makes neutrality really interesting as a choice, because a lot of monsters might turn out not to be Chaotic after all and can be lured into service. Flexibility of alignment is an important idea for this. If orcs are always chaotic, then an encounter with them has fewer possibilities, because a neutral PC can't lure one into service. The same is true of bandits: the 50/50 chance of them being neutral should guide the referee in how they are played. When creating new monsters, I think such questions should be considered in some instances. After all, goblins and trolls only appear in the chaotic column of OD&D, and won't be attracted by offers from neutrals. But even if you aren't using the "vanilla" monster list, your encounters wind up richer if it's possible to recruit some of them (or if PCs even seek out neutral monsters to hire). It's also worth realizing exactly how powerful the OD&D version of Charm Person is, because it's easy to forget if you're not reading the booklets: "If the spell is successful it will cause the charmed entity to come completely under the influence of the Magic-User until such time as the "charm" is dispelled (Dispell Magic)." Supplement I: Greyhawk introduces limits on Charm that make it substantially less permanent (the system of multiple saving throws that makes it into classic and advanced). But in OD&D it's an instant henchman, if you want it - a failed saving throw is all you need. Such henchmen give great potential reactions for subsequent encounters. Elves encountered in a dungeon may see a human with an orc and minotaur in tow and make the assumption that they're monsters to be defeated at every cost, and the human is either in league with them or a hostage. On the opposite side, an ogre guard could be the PCs' key to getting into a fantastic environment like the troll market in Hellboy II. 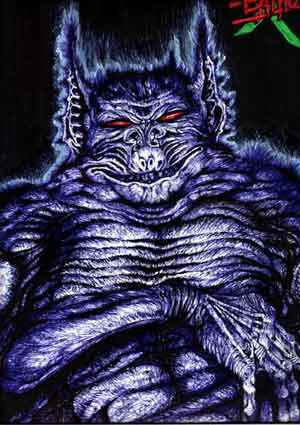 A given monster could take the PC as a threat, or as a "monster" human allied with monsters. Of course, turnabout is fair play; if the PCs can try to lure monsters into service, then monsters should also be able to do the same for them. Flexible alignment makes a great way to do a theme dungeon: monsters that are neutral or chaotic are the ones that are likely to try and hire PCs, while chaotics will tend to stay away from them, being on different "sides." And there's a tremendous amount of roleplaying to be done with regard to how far the PC(s) and the monsters trust each other. In the civilized world, this will definitely have various implications. 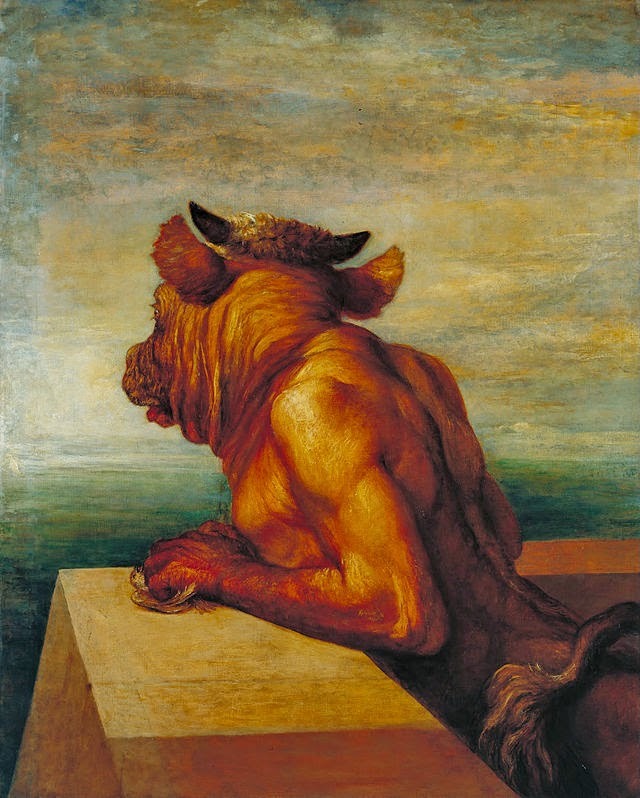 One scenario is the, "Damn it, Theseus, you were supposed to kill the minotaur, not help it escape!" variety where the monsters are treated as such and the PCs considered evil or reckless for accompanying them. And there are all kinds of possible responses, from betrayal of the monster hirelings to various shenanigans to help them pass. But the opposite choice has a lot of possibility for world-building. OD&D does seem to indicate a world where monstrous creatures are sometimes in the employ of non-chaotic humans. It's also got a very Judges Guild vibe if you think of a village where you might go in and see an ogre – who in fact hauls very heavy things and smashes goblins at the behest of the townsfolk. It's not going to fit everyone's vision of fantasy, but I'd argue that this sort of thing is more essential to OD&D than people today realize. There are a lot of ways to run with this one, and I think it shows a certain myopia of fantasy that this concept died out over time. It's worth thinking about what it can do for your games. 1974 was an interesting year for OD&D to come out. It sat at a critical point in the development of fantasy as a genre that we easily take for granted. The sword & sorcery genre that had sustained Gary Gygax through his youth was in its resurgence, while Tolkien was moving into dominance via the unlikely route of the counterculture and the Ballantine Adult Fantasy line was cycling older material back into the genre. Fantasy literature as we now know it was not yet a coherent genre with standard assumptions. The idea that D&D is a game primarily about "fantasy" in the post-Tolkien sense has always had a touch of historical revisionism to it. It has Tolkien elements, but these are strewn about with ideas straight from myth, others from the sword & sorcery lineage, and fresh inventions alike. Much of what has gone on in the OSR is about cutting out the more Tolkienesque elements (or distancing them from Tolkien) and playing up either the sword & sorcery or the weird elements, or both. This is sometimes done under the cover of "Appendix N," but it really has little to do with Gygax's list of favorite novels, which contain heaps of science fiction anyway. In Monsters & Treasure, plenty of science fiction and science fantasy creatures appear: Martian creatures are suggested, as are giant insects, dinosaurs and others. But the really interesting find is under "Other Monsters," which contains a listing for "Robots, Golems, Androids" that reads: "Self-explanatory monsters which are totally subjective as far as characteristics are concerned." Golems later became codified as enchanted beings, growing greatly removed from the creature of Jewish folklore into any wizard-made construct. But robots and androids were swept under the rug along with the Martian creatures after the original boxed set. Indeed, unlike several other categories of additional monsters, they never even make it to The Underworld & Wilderness Adventures. But they have fascinating implications for referees who want to add science fantasy elements to their settings. 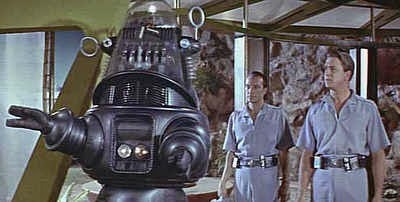 So if robots were self-explanatory, they probably looked in the imagination more like Robby or the robot from Lost in Space than our more contemporary references for robots. Androids were, ironically, probably cheaper to film but only catching on around the time of OD&D. Of course, our imaginations hardly have to be limited by what someone in 1974 would've seen as a robot; I simply think that it would be awesome to put something that looks like Robby the Robot in a D&D dungeon. In an otherwise pseudo-medieval world, why exactly are there robots and androids in the depths of dungeons or lurking in the wilderness? There's always room for ancient astronauts, or even more recent ones. It's also possible that the D&D world is actually long after an apocalypse in a highly technical civilization; after all, Planet of the Apes was current and had pulled off just such a trick. (This is also suggested by Appendix N, where post-apocalypse books like Hiero's Journey and Sign of the Labrys were recommended, but that was 5 years after OD&D.) There's planar travel, and if all else fails, there's the old excuse that "a wizard did it." Robots can take any shape we like. Clockwork beings might be a closer aesthetic fit to much of what people like in their D&D; I think the visual design of the Golden Army from the second Hellboy film has a lot to recommend in this genre. But really there's no limit; robots don't even have to be anthropoid. It could be like the Terminator, or like an industrial robot arm from a modern factory, or small robots like the mouse droid in Star Wars. One consideration a referee should give to robots is whether they are adapting their environs to their high-tech nature, or vice versa. Maybe a robot has made an area of a dungeon into a high-tech laboratory, replete with inventions and attempts to replicate its own technology level. Or it could have adapted to the low-tech but magical world it finds itself in, for instance with plate mail bolted onto its chassis or embedded a magical gem into its circuitry. The possibilities really are endless, all from two lines in OD&D. That's some kind of magic. Apologies if this is a bit long; if you want to find out how a Six-Page Dungeon Level will work, just skip to the end. This post is prompted in part by an article I've shared before, Why Word Walls Won't Work, as well as Ramanan Sivaranjan's review of Forgive Us and the 2014 One Page Dungeon Contest Entries. And of course usability issues from my recent post against boxed text. Most reviews of Forgive Us, unlike Ramanan's, don't highlight the layout (which you notice more in the printed book than if you're reading the PDF). That's unfortunate, because it's a really well-done product in that regard. Green took the two-page spread as the fundamental element of his adventure and made it so that each spread basically has what the referee needs at that point in the adventure. That is an excellent goal. 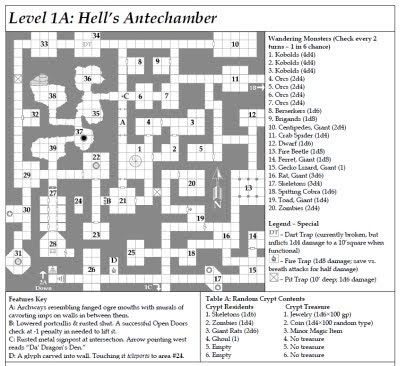 There are a couple reasons that I've been thinking about the one-page dungeon template; aside from the fact that this year's contest has just ended with 110 entries, Michael Curtis is nearing completion of Stonehell II, a product built around a modified one-page template, and I recently used the first half of Stonehell in a discussion as an exemplar of good layout. I find that one-page dungeons often tend to be one-idea dungeons. It's too compact to convey a full dungeon level that isn't very conventional, so one-page dungeons generally have one or two gimmick ideas and not much more to offer. Curtis busted this limitation open in Stonehell by going to two pages, having more pages before the two-page spread detailing the rooms that needed more detail, moving full monster stats outside of the key, and putting charts at the end of the product for detailing the rooms that only get a couple of sentences. There was an entry in the one-page dungeon contest that does stand out to me, Stellarium of the Vinteralf by Michael Prescott and Michael Atlin. I'd seen it before, and I back their Patreon campaign so this isn't exactly news to me, but it is a very neat design. Isomorphic maps have certain limitations, but it shows a good way to integrate text and pictures in communicating ideas. As a system-neutral thing I think that it's not 100% as useful as I'd like, but it's influenced what is kicking around in my head. Both the standard module format (every room with a description in the key) and the one-page dungeon format fail to highlight the central points of interest. "Filler" rooms have equal standing with the most complex areas of the dungeon. (I'm tempted to call this "Dwimmermount Syndrome" but not everybody is a backer so you may have not actually read Dwimmermount.) Stonehell solved this somewhat by bringing those points onto separate pages from the main key, but I'm wondering if this isn't somewhat backward. Unless a dungeon is so meticulous in its design that every element, every monster or treasure presented is totally unique and necessary in its specific place, there is no reason for published dungeons to stock filler rooms. You need these rooms in gameplay for pacing, which is why tournament modules tend to be poor fits in campaign play. Every room shouldn't need to be a special room; if you had, say, thirty rooms in a dungeon level, there should be maybe 10-12 rooms that need specific details. The other 18-20 rooms can be determined by charts. Now, as a rule of thumb I would say that having to flip 1-2 pages isn't a bad thing. You still fundamentally have your "place" in the book, even if you need to make a cross-reference back and forth. Having to go to a completely different section of the book, though, is extremely annoying in play. This was a weakness of Stonehell, where the charts for randomly determining room features are inconveniently located in the back of the book. Pages 1-2: This details the overall feel of the level, provides stats for any new monsters or magic items introduced in the dungeon level, notes about level features and any clusters of rooms, and any special rules that may apply to areas within the level. Very much like the first two pages of a dungeon level quadrant in Stonehell. Pages 3-4: A two-page spread with the dungeon level map and the keyed areas, representing about 1/3 of the total areas indicated on the map. Other areas can have contents indicated in a legend format, such as letters or symbols for "Monster," "Treasure," and "Trap." Pages 5-6: Tables and charts. Including random encounters for the level, and potential monsters, treasures, traps and anything else thematic (dungeon dressing) that might be in the unkeyed areas or enhance the keyed areas. As necessary, illustrations and so forth go on pages 1, 2, 5 and 6. The ideal is that a referee needs to read pages 1-2, and then just glance through pages 3-6 in order to "get" the central idea of the dungeon. It lacks a bit of the snappy cachet of the one-page dungeon level, but I think that it gives the proper room for a designer to focus on putting the correct balance of their own ideas and not wasting our time with filler rooms. It also is pretty close to my ideal for use at the table; at most you only have to flip two pages. I'll see about getting together a dungeon level as an example in the near future.